And here…. Qarth. Qartheen guads in the front, the dignitaries of some sort. We can only identify two with any certainty: standing in the back is Nonso Anozie as Xaro Xhoan Daxos, “the prince of Qarth” according to the actor. 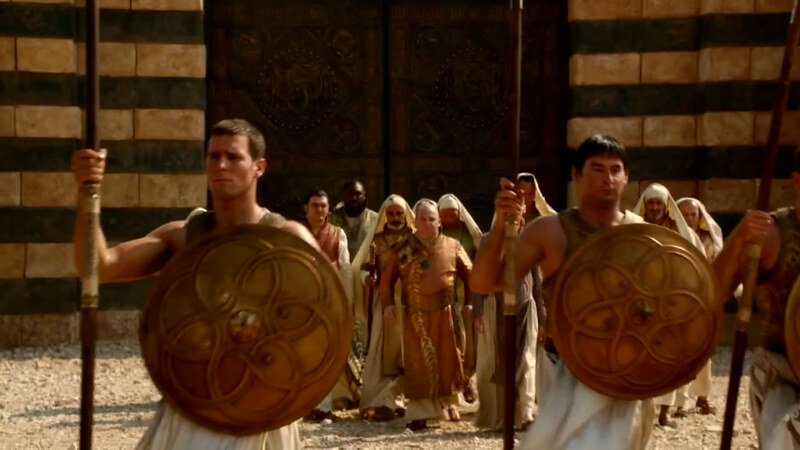 And, not really seeable here, the man in purple obscured by the guards is almost certainly Ian Hanmore as Pyat Pree, one of the warlocks of Qarth. A slightly different frame suggests to me that his lips may in fact be painted blue, just as is described in the novel (there it’s because of his habitual use of a sorcerous potion called shade of the evening). The men with their heads covered are probably supposed to represent some sort of priesthood (or maybe they’re the Pureborn)... and just guessing that the figure in pale red in the front is Nicholas Blane as a character called “the Spice King”. Not from the books, but perhaps representing some sort of reference to the Ancient Guild of Spicers… or, more likely, simply some sort of simplification of the political landscape in Qarth. In the novel, there are three main factions: the Pureborn are the nobility, the merchant guilds, and the warlocks.